Let's see what the undead think of dual .50 Desert Hawks. 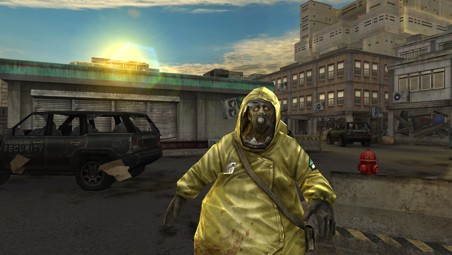 Considering Glu Mobile's predictable smartphone and tablet games history, we expected Contract Killer Zombies 2 Origins to play exactly like the original, with a fixed first-person perspective. Imagine our surprise after learning that the follow-up is in fact a free-roaming third-person shooter, filled with a plethora of missions set within the dangerous Savehaven Research Center. If you're at all familiar with Madfinger's Dead Trigger, Origins is essentially that game from a different perspective. Suffice to say, we dig it. For starters, the game has a female protagonist. Say what you will about her perfectly sculpted backside and questionable post apocalyptic attire, but it's nice to see a heroine step into the spotlight, as it offers a welcome break from all the gun-toting dudes. Aside from visual aesthetics, however, Evelyn doesn't necessarily benefit from character development, which is fine. The focus was put squarely on blasting zombies to pieces, and with that being said, Contract Killer Zombies 2 delivers this visceral experience and then some. In fact, zombie's heads explode, their limbs fall off and their bodies spew gallons of blood with a well-placed shotgun blast. You'll definitely get some kicks from walking up to the shambling horde and laying waste to these flesh eaters using assault rifles, dual machine guns and even exotic weapons like a bazooka. Of course, if you prefer to get up close and personal, the baseball bat gets the job done. Us? We prefer the Ancient Katana and chainsaw. What's especially interesting about the combat is Glu's decision to go with auto-fire. Instead of mashing some virtual button, you simply line up Evelyn's targets and she pulls the trigger. Quite frankly, it's a smart idea. Not only does it conserve ammunition, but it also frees players from worrying about touch screen controls. However, if you prefer frantic button tapping, you can switch off auto-fire from the options menu. 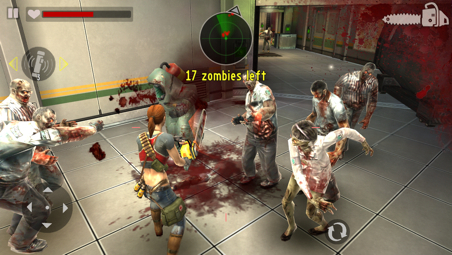 As for the bulk of the game, the developers broke Contract Killer Zombies 2 into bite-sized missions that mostly involve escorting bonehead non-player characters and fetching supplies. Not exactly the most thrilling objectives, but on the flip side, you should be more concerned with killing zombies. This being a freemium game, currencies involve cash and gold, the latter being increasingly difficult to come by. As expected, Glu makes the coolest weapons and gear the most expensive, thus bringing in-app purchasing into the equation. No need to spend additional money, but know this: the game grows exponentially more difficult the further you level up and progress. Eventually, that AR-19 Basic rifle won't get the job done against tougher foes, like the goop-spewing Thrower, and zombie-summoning Piper. All is not rosy, however. The designers, for whatever strange reason, litter environments with excessive rooms and alleyways that we can't help but explore, only to come to the disappointing realization that none contain ammo and bonus goodies. What's more, the game clearly suffers from performance issues, and has a tendency to chug when too much happens on-screen and during transitions. We're also a bit baffled at the way zombies attack. They don't latch onto Evelyn or bludgeon her to a pulp. Instead, they get within a certain range and she automatically takes damage. This makes judging the "safe" distance between her and a zombie difficult to gauge. Ultimately, though, Contract Killer Zombies 2 Origins is a fun zombie shooter with plenty of gore and content to keep you firing for days. It presents nothing we haven't seen before (admittedly, the mission screen displayed as a map, complete with flashlight, is a nice touch), but who cares? You should pay more attention to the creatures trying to rip Evelyn's face off. What's Hot: Auto fire means one less virtual button to worry about, plenty of missions to complete, well-stocked arsenal of dangerous toys, switching weapons pauses the action, free-to-play. What's Not: Performance troubles, repeating objectives, mostly unhelpful A.I.